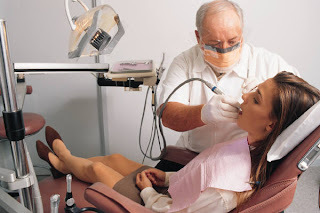 Cradles and Graves: Dentist vs. Gyno: What's Your Vote? Next week I have to go to the dentist for a routine checkup and I'm so not looking forward to it - spreading my jaws in front of total strangers, having my gums prodded, people seeing my naked uvula. Oh, the indignity! So I'm taking a survey: Which is the lesser of two evils - going to the dentist or going to the gyno? I'm talking routine dental checkup and cleaning vs. routine "yearly" (laughs bitterly) gyno exam. If you had to submit to one or the other right now, which would you choose? Sidenote: Q is obviously not qualified to vote on the dentist vs. gyno question since he lacks the necessary body parts (lucky!). He has nevertheless indicated that were the choice between a dental exam or watching a gyno exam, he would choose the latter. So cast your vote.... what's your pick and why? Ha ha ha! Quickie! So funny! Even though I have had my share of awkward/uncomfortable gyno procedures and too many shots from the crotch cam; I still think I'd rather visit the dentist! Although a routine quickie at the gyno doesn't sound as horrible as it used to. I've had much worse. I would prefer to have rotten teeth and keep my legs closed for the rest of my life if I could. but since I do like to smile, and I have a horrible case of stirrupaphobia I guess I will choose the dentist for now. thanks for stopping by my blog. Hope your ttc efforts go well. I did find your post about the death of animals vs babies interesting. I think you have a valid point. Although I'm sure Squib was quite the hamster, I wonder did he receive many funeral gifts? I had a good friend who lost her baby due to a cord problem. I don't remember the technical name for it. I will have to ask her. gyno. at least you don't have to stare at them while they poke around, and there are fewer lectures involved. even though i now know i have to get DOUBLE pap smears for the rest of my life, my answer stands. It's all in your mind baby. Just try to only focus you're purpose why wanted to this or that and why you wanted to go to a dentist or to a gyno. But since you're asking for a vote I'll go for dentist simply because I am a dentist. Going bias mode. I'd much rather endure a painful root canal than go to the gyno. Yes, a gyno visit is much quicker, but it's still intimate and more invasive. I'd let someone poke around my mouth over poking around in my lady bits anyday.